Which map offers the funniest experience? Discovering a new place has to be like a treasure hunt! The visitor checks the map thanks to QR codes on the points of interest. This makes it very easy to take them to a beautiful beach or to that unfairly underestimated museum. Why not pushing gamification a little further and suggesting the winner to look for a prize at the tourist office? You can easily share your map with a link! Once the map is ready, we will provide you with a link: it is up to you. This link leads towards your map, hosted by us. You can use it in an email, or share it on social media. The map recognises automatically the user’s language! 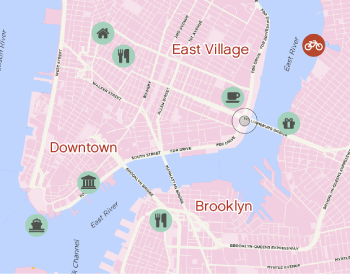 Offline maps for iOS/Android bring the users a better consumer experience. Check out our App (FokusMap) on iOS! Click below to download. Are you sure that you really know your users? Gain some precious customer insights for upgrading your destination while using your map: Which activities do they like? What time do they prefer doing them? What are the related activities that you could recommend them? Simple: analyse the number of clicks on every icon of the map. Advanced: let us analyse you visitors’ activity according to their nationality. What are their favourite cultural activities? Observe the visits to your map depending on the date and the hour. Can you track your user trends? Are you attracting more traffic to your website? Observe the distribution of your visitors nearly in real-time and implement your map in means of information and/or safety. This function is currently in progress and will be finalized in 2018.